Ai, was the second city taken by Israel after the passage of the Jordan. 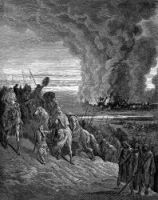 It was situated east of Bethel and "beside Bethaven," and was destroyed by the Israelites after their passage through the River Jordan. Following Joshua's victory against Ai, he built an altar of great stones on the mountain called Ebal. He covered the stones with plaster and wrote on the plaster the words of God's law, as Moses had commanded the children of Israel to do before they crossed over Jordan. On this page you'll find illustrations of Ai from the Bible taken from my collection of antique Bibles and story books. Feel free to use these pictures of Ai from the Bible, in your artistic creations. Click on the Bible Ai illustrations below to see more details about saving a free image of the ancient city of Ai or about purchasing the images of Ai at a higher resolution.